Martha writes to Elizabeth discussing the drought that year and asks for aid from Elizabeth. This letter is a request for donations in order to keep the Berry Schools running and keep the students in school there. 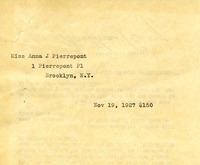 The note on the side is from Augusta P. Rose, who says she is sending her annual donation with Mrs. Hammond. $100 donation from Wm. 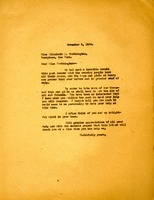 Jenkins in response to a donation request from Martha Berry. The letter explains in detail the work that students at the Berry Schools are doing and how it will benefit themselves and society. 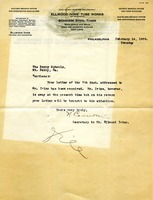 The Secretary to Ellwood Ivins sends a letter to The Berry Schools explaining that Mr. Ivins is out of town and will be replying to the letter sent to him after he returns. 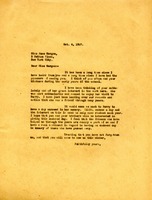 Also included is the back page of the letter with information regarding Ellwood Ivins' Tube Works. In this letter from Berry Schools to Miss Anne Morgan, Miss Berry asks if she would like to spend 2500 dollars to endow a ay to her mother. She says the money will be used for children scholarships. $300 donation from Laura Wick in response to an appeal letter. In the appeal letter, Martha Berry writes Laura Wick to inquire after a donation toward the schools. $150, she says, will provide one year's tuition for a young boy or girl, although a gift of any size "will be greatly appreciated." She also says that if she were strong enough she would go directly to Miss Wick and tell her of their need, but she cannot and therefore is writing. 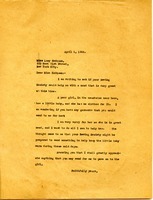 This is a letter to Miss Lucy Hodquam from Martha Berry asking her and her Sewing Society to make clothes for an infant.